As I have mentioned before, my oldest son can sometimes be a reluctant reader. It took him a long time to accept chapter books and not be intimidated by lack of pictures. NHL is a third grader and loves to read about science, people, and places. If we have tour books around the house for an upcoming vacation he will read them. I have absolutely no complaints about this. As a reading teacher, I applaud almost any type of reading a child will do. Last year, while at Disney Social Media Moms Celebration, I briefly met Tracie A. Cook. Tracie, who runs Vacation Field Guides, is a veteran teacher and Disney fan who is also an author. When these books arrived the other day, the boys were so excited. I explained to them that both were books about Walt Disney World that were made just for kids. Kid Tips for Walt Disney World: Touring Advice by Kids for Kids is just that. 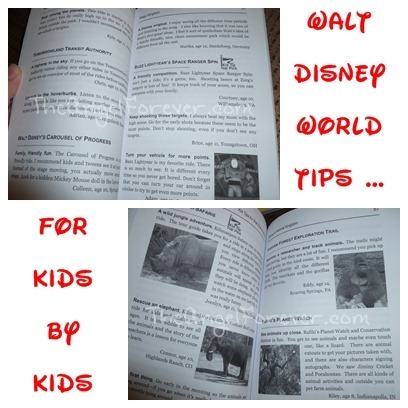 The book contains thoughts, via quotes, from children ages 7-15 about Walt Disney World. There were things to know before you go, specific items to see/do while in each of the parks (with specifics about some rides), dining suggestions, and many other items. NHL enjoyed reading these and weighing in on what his views were since he has been to Walt Disney World multiple times now. I also know he’s excited to possibly help Tracie by filling out a survey for upcoming books. I think the kid connection will help get kids involved in planning your upcoming trip. Walt Disney World Adventure: A Field Guide and Activity Book for Explorers is an interactive book for kids to learn while exploring the magic that is Walt Disney World. As an educator, Tracie has packed this book with a lot of items to make children think while completing their exploration. As I have said forever, there are so many EduMICKational experiences within Disney World if you take the time to look for them. The book begins with a letter to the explorers, key to navigation symbols used in the book, and some tips before they head into the parks. From this point, there are pages filled with items to complete, locate, find, and research in fun ways while touring. Yes, you will want a pencil to write down items as they are located. Here is one of the pages that caught my son’s attention when looking at it. I have to admit, I am a little jealous of this book. I want to head into the parks and try these out. The teacher in me thinks that it looks like a great hands on learning exercise while having a lot of fun. NHL will definitely be reviewing this after he tests it out on our upcoming trip to Walt Disney World. I would love to know if your children (or you) have tried either of these books and you have any tips for children testing out the adventure. As always, please share what you have read recently. Be sure to link up to your book posts in the comments below. Include something you read on your own, with a child, or someone else. Tuesday Tales are all about spreading the love for books. 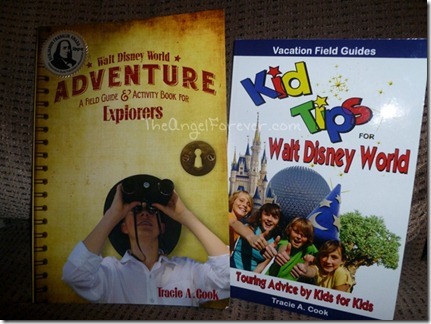 Disclosure: We received these books from @WDWFieldGuide in order to facilitate this review. No other compensation was given. The opinions expressed in the review are my own. Two Amazon Affiliate links are included in this post for the books mentioned. I will receive a percentage of money for the sale should you opt to buy the books through these links.